The Dakota A1 QuickDraw Western Holster - May be ordered in a double gunslinger style too! The A1 QuickDraw is a classic and traditional holster design and is one of our top sellers for single action shooters. Authentic to the Spaghetti Western era, early 1900's, made from top-grade double shoulder vegetable tanned cowhide. 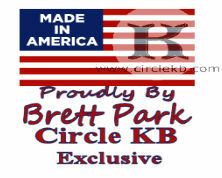 Hand cut, bench made by Maker Brett Park, exclusively for Circle KB. Fully lined with soft lining leather, meticulously handcrafted with the finest leather available and expert craftsmanship. Hand cut from top-grade double shoulder vegetable tanned cow hide. 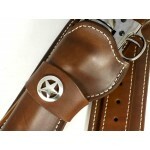 The Dakota Buscadero style gun belt is hand laced with 18 pistol rounds and 4 shotgun rounds. You can also choose all pistol loops. Steel reinforced chamber and shank areas for guaranteed smooth and fast draw. Holsters can be made for different model guns. If you want a double holster rig and your second gun is different please specify. Ranger Star Concho Set Included. Select two tone Silver and Gold or Silver. 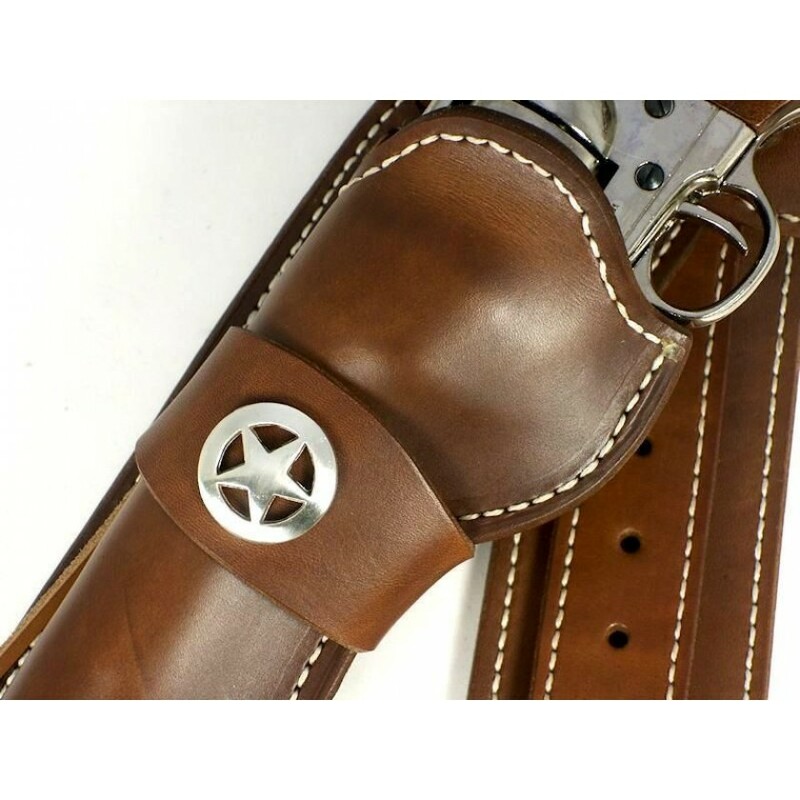 Gun belts are hand laced wet and dried to your calibers and you may have them all laced for pistol rounds or keep the shotgun/rifle loops as shown. The holster gives sturdy support for the gun while still allowing a fast draw and easy glide re-holster. First popularized in the early fast draw competitions in the 1900's and Hollywoods' famous Spaghetti Westerns.